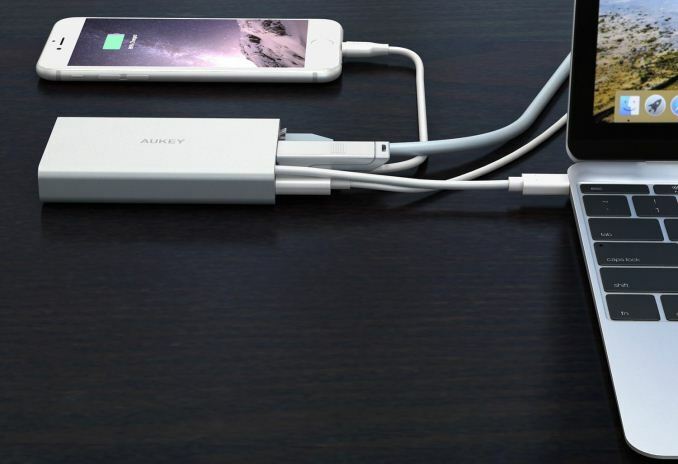 AUKEY has started to sell its latest USB Type-C hub for Apple’s MacBook laptops and other computers that need something more than USB-C and wireless interconnection technologies. The new CB-C55 hub expands the port allocation to provide outputs for displays, projectors, Gigabit Ethernet and traditional USB Type-A devices, along with supporting power delivery input to the main machine. Modern notebooks are very thin, whereas legacy ports like 8P8C/RJ45 (Ethernet) and D-Sub were designed in the seventies and the eighties when PCs only existed in desktop form-factors. Even more modern ports such as the HDMI port were not designed for ultra-thin laptops. Today, it is either impossible or very complicated to install such ports into ultra-thin notebooks, and the opinion of some OEMs is to combine them into a single USB-C port and require additional dongles. As a result, various dock stations and USB Type-C hubs are gaining popularity because people still need their legacy devices/connections, but want to have the thinnest and lightest devices possible. 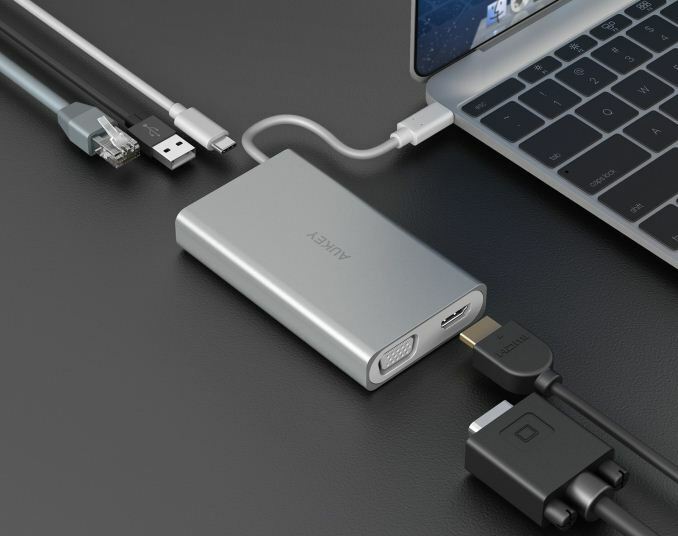 The AUKEY CB-C55 USB Type-C hub was designed primarily for road warriors who use modern ultra-thin devices such as Apple’s MacBook, MacBook Pro (2017), HP’s Spectre, Lenovo’s Yoga 900, Google’s Pixel and others. The CB-C55 has a two USB Type-A connectors, a D-Sub header (max resolution is 1920×1080), an HDMI output (max resolution is 3840×2160 at 30 Hz) as well as a GbE port. The unit is made of matte aluminum and weighs 120 grams. Like many other USB hubs from AUKEY, the CB-C55 has its own power connector and thus can power laptops as well as devices that can be charged using USB ports. The input of the CB-C55 is 5-12 V at 2 A, so, the maximum amount of power it can deliver is about 24 W. Meanwhile, since the CB-C55 only supports USB 3.0 Type-C interconnection, the maximum bandwidth it can provide to other devices is limited to 5 Gbps. The AUKEY CB-C55 USB-C hub is currently available from Amazon for $99.99, down $30 from the typical price of the product, which is $129.99, according to the retailer. The hub is backed by a two-year warranty. I would like a USB C Hub. Every time I see one mentioned, it turns out it's just an other old 5Gbps USB A hub with some aditional (usualy old style or old version) extra display and ethernet pors. So far, I have not come accross any proper USB C hub, where the input is USB C Gen 2 and a least 2 of the output (or should I call them input) ports are also USB C 10Gbps. The limitation isn't that the Type-C port is limited to 5 Gbs. 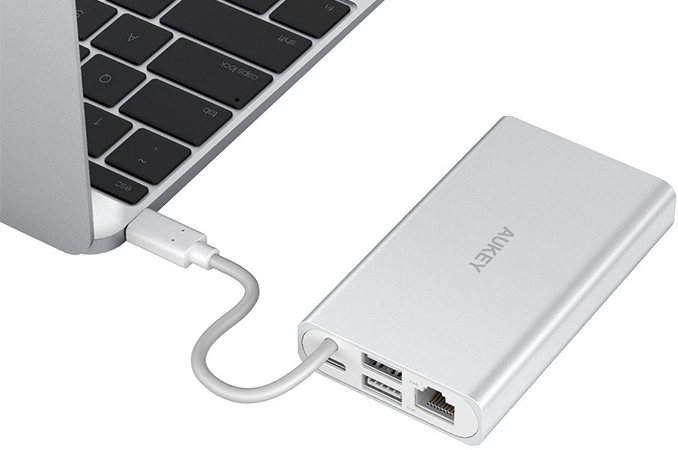 There are 4 channels in USB C that can be used to provide Thunderbolt, DP or USB3 or a combo. Most use 2 for displayport (so 1x 2560@60 or 1x 4K@30) and 2 for USB 3 speeds. They could have given the hub the ability for 4K displays at 60Hz, but it would have meant only USB2 speeds for those ports / the LAN port.